This article is about the Pikmin as an entity. For other uses, see Pikmin (disambiguation). Official artwork of seven types of Pikmin from Pikmin 3. Pikmin (ピクミン, Pikumin) are the titular species of the Pikmin games. They come in multiple variants, including Red, Yellow, Blue, Purple, White, Rock and Winged. Pikmin follow Captain Olimar's command both in their home series and in their appearances in the Super Smash Bros. series. Captain Olimar with a full army of 100 Pikmin. Pikmin are humanoid, plant/animal hybrids that follow around Captain Olimar. Pikmin are bipedal and have a plant-like appendage on the top of their head which, over time, develops from a leaf into a bud and finally, into a flower. Each Pikmin has a specific ability, and up to 100 can wander the planet and follow Olimar. Red, Yellow, and Blue Pikmin were introduced in Pikmin, whereas three more variants were introduced in Pikmin 2, and a further two in Pikmin 3. Red Pikmin - Red Pikmin have 50% more offensive power than other Pikmin and an immunity to fiery hazards. Red Pikmin have pointed noses. Yellow Pikmin - Yellow Pikmin fly higher than other Pikmin when thrown, thanks to their elf-like ears. They also have an immunity to electrical hazards as of Pikmin 2, and were the only Pikmin capable of carrying bomb-rocks in Pikmin. As of Pikmin 3, they are no longer the only Pikmin capable of carrying bomb-rocks, but are tied with Rock Pikmin for the fastest digging speed. Blue Pikmin - Blue Pikmin cannot drown, which also makes them capable of rescuing other Pikmin that accidentally fall in the water. By extension, they are immune to watery hazards. Blue Pikmin have pink gills where a mouth would be expected. Purple Pikmin - Purple Pikmin are both ten times as heavy and ten times as strong at carrying objects as other Pikmin. These traits also give them the highest attack power and the fastest digging speed in Pikmin 2. While these two traits were lowered in Pikmin 3, which ties them with Red Pikmin in these respective categories, Purple Pikmin nevertheless retain their distinction as the strongest when carrying objects. Instead of an element, Purple Pikmin boast resistance to roars and, in Pikmin 2, wind. When thrown, Purple Pikmin will cause a shockwave to occur on impact because of their weight; this can stun, injure, or even outright kill enemies. However, their heavy weight also results in them having very slow movement speed. Purple Pikmin have hair-like protrusions on their head, and are both slightly taller and noticeably fatter than other Pikmin. They also have a magenta-colored bud and flower, instead of a white bud and flower like Red, Yellow, and Blue Pikmin. White Pikmin - White Pikmin have the fastest mobility out of all Pikmin, and have large, red eyes that allow them to see underground and detect buried treasure. White Pikmin are also poisonous, as they will damage enemies should they be eaten, and boast an immunity to poisonous hazards. Although they have average attack power and digging speed in Pikmin 2, both of these traits are below average in Pikmin 3, which ties them with Winged Pikmin in these respective categories. Like Purple Pikmin, their bud and flower are colored magenta. Bulbmin - A parasitic form of Pikmin that has infected a Bulborb, a common enemy in the series. The actual Pikmin is never seen, and instead constantly live inside their host. They are immune to fire, electricity, and poison, and can move through water. However, Bulbmin are only found in certain caves in Pikmin 2, and are unable to be taken to the surface. Rock Pikmin - Unlike other Pikmin, Rock Pikmin are shaped like irregular hunks of rock instead of having smooth, humanoid bodies. Their hardness gives them the highest attack power when thrown, allows them to crack crystalline objects when thrown, and renders them immune to being crushed and impaled. Despite being the bulkiest Pikmin, they are actually tied with Yellow Pikmin for the fastest digging speed. However, they are unable to latch onto enemies, and instead choose to repeatedly ram into them. Their arms, legs and stem are colored gray, while their bud and flower are colored lavender. Winged Pikmin - Winged Pikmin are pink and have both insectoid wings and large, blue eyes. Their wings allow them to fly over hazardous terrain and ground-based attacks, as well as uproot certain plants from the ground and lift obstacles. They can also give easy chase to airborne enemies, but are tied with White Pikmin for the lowest attack power and digging speed. Like Rock Pikmin, their bud and flower are colored lavender. The plant on an individual Pikmin's head indicates how developed and strong it is, affecting battling ability and running speed. A fully bloomed flower means a Pikmin is stronger and faster than a Pikmin with just a leaf on its head. Ordinarily, Pikmin leaves become Pikmin flowers if the Pikmin drink nectar, but a flower can naturally grow if Pikmin are left in the ground long enough before being plucked. The trophy specifically about the Pikmin is unlocked as one of the trophies that can be collected randomly in the Trophy Lottery. The Pikmin trophy in Melee. These strange beings are part plant, part animal. They spend most of their time buried in the earth, but they will befriend whoever plucks them, as evidenced by their devotion to Captain Olimar. Each Pikmin has a leaf on its head that grows into a bud and finally a flower. Like a flower, the life of a Pikmin is both fragile and beautiful. Captain Olimar and his Pikmin. In Super Smash Bros. Brawl, Pikmin are featured as part of Pikmin & Olimar, the playable collective of characters from the Pikmin universe. Pikmin follow Captain Olimar after Olimar plucks them. 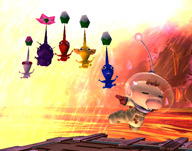 Each Pikmin has a specific ability, and up to six will follow Olimar in a single-file line. Red Pikmin - Possesses the strongest aerial attacks. Deals flame damage and is immune to fire attacks. Yellow Pikmin - Possesses slightly larger hitboxes than other Pikmin, though it is weaker, with only the White Pikmin being weaker in all attacks. Travels in slight arcs when thrown. Deals electric damage and is immune to electric attacks. Blue Pikmin - Higher health than other Pikmin, and possesses both the longest ranged grab and the most effective throws. The only Pikmin that can swim and is immune to water attacks. Purple Pikmin - Does not fly far when thrown, moves slowly, and possesses less range in its smash attacks and grab. Possesses the strongest smash attacks, and possesses the most powerful throw (its up throw) in Olimar's arsenal. Slams into enemies instead of latching on when thrown. About twice as much health as other Pikmin. White Pikmin - Quick and light. Can be thrown faster and farther, and when latched onto opponent, it deals three times as much damage compared to other Pikmin. It also possesses a more damaging pummel. Has half the health of other Pikmin, often being killed in one hit, and possesses drastically weaker attacks than the other Pikmin. Pikmin naturally develop from leaf to bud to flower every 20 seconds, but this is merely a visual aesthetic. A type of Pikmin--which are odd beings who grow like plants yet are as mobile as animals. Red ones are heat and fire resistant and are strong attackers, which makes them valuable when facing dangerous foes. Purple Pikmin are also tough fighters, but since it's difficult to increase their numbers, red Pikmin are easier to manage. Red Pikmin have distinct pointed noses. A type of Pikmin, which are curious creatures that follow and obey the person who picks them. If you take advantage of this trait, you can get them to help Capt. Olimar and Louie. The blue Pikmin are at home in water and cannot drown. Need to retrieve an object underwater or cross a water hazard to disarm a trap? Blue Pikmin are just the allies you need. A type of Pikmin. Take a nutrient-rich pellet to a flying saucer known as an Onion, and it will produce the mysterious beings known as Pikmin. Yellow ones fly higher than other Pikmin when tossed by Olimar or Louie. Unlike other Pikmin, they're also highly resistant to electricity, which makes them invaluable when battling enemies like anode dweevils. A type of Pikmin. White Pikmin are resistant to poisons and are themselves toxic to creatures that eat them. Their low weight makes them very speedy, and they can also dig up buried items. White and purple Pikmin do not live inside Onions, so you must change other Pikmin into them by tossing them into ivory candypop buds and violet candypop buds. A type of Pikmin, much heavier and slower than other Pikmin. When thrown, they impact with such force that they may kill or stun enemies. They're also incredibly strong--one of them can carry an item that normally would require ten Pikmin. While they're more powerful fighters than their red cousins, their slow speed hampers their effectiveness. The following stickers are related to the Pikmin species. Olimar still uses the five Pikmin types as of Pikmin 2 in SSB4, and, unlike in Brawl, he can have only three out at a time. The Winged Pikmin from Pikmin 3 are used in Olimar's new up special move, in which they pick Olimar up and carry him around. Despite being originally planned for the game, Rock Pikmin are not integrated into Olimar or Alph's movesets. Pikmin will also appear in the Garden of Hope stage, fixing the broken elements of the stage. This Pikmin has a red body and a long, pointy nose. It was the first type of Pikmin Olimar ever met. In Smash Bros., they have the second highest attack power among the Pikmin. Like their fiery color suggests, they can attack with flames and withstand them. Telling Red Pikmin apart from the other Pikmin is easy: these ones have long, pointy noises. Also, they're red. They're the very first kind of Pikmin Olimar finds on their planet, and their high attack power makes them very useful. In this game, they can deal powerful attacks, and they're very resistant to fire damage. This blue Pikmin walks around with its mouth ajar. At home in the water, they're very helpful when objects are submerged and need retrieving. In Smash Bros., blue Pikmin have defense second only to purple Pikmin. They are also able to do more damage when thrown, so don't be shy about hurling them at foes. The things that make blue Pikmin different from all the other Pikmin are that they have mouths and that they're pretty good swimmers. They're slightly hardier than most other Pikmin, and they do more damage when you throw them. So, as soon as you get one of these, make sure to throw it right at someone straight away! This yellow Pikmin is sporting some pointy things on its head. Maybe those are ears? Hmm... Anyway, yellow Pikmin are immune to electricity and are the lightest Pikmin in the Pikmin series. In Smash Bros., a thrown yellow Pikmin will fly through the air in a nice curve, zapping anyone it comes in contact with. Yellow Pikmin have big, sharp ears and conduct electricity very well. These two facts are most likely unrelated. Olimar's side special can throw this Pikmin high into the air and cause electrical damage to all fighters who stray too close! These tiny, white Pikmin have bright-red eyes. They are the fastest of the Pikmin, perfect for finding and retrieving hidden treasure. In Smash Bros., you can use them to poison your enemies. Since they can fly the farthest of any Pikmin when thrown, use them to poison enemies from afar. These small, fast-footed Pikmin are white with red eyes. That ominous look they have might give you the chills, and you'd be right to be scared - the little blighters are poisonous! In this game, they'll hang on to any enemy you throw them at and generously share their venom with them. These purple Pikmin are the strongest, but they're also slower and heavier. In Pikmin, they can be thrown at animals to stun them! In Smash Bros., they're great for attacking and launching, but they've got a pretty short reach. Get close to your foe to make these little ones truly effective! These purple Pikmin are much stronger than their colourful counterparts, but they're also slower and heavier. In Pikmin, they can be thrown at animals to stun them! In this game, they're good at both attacking and launching, but since they haven't got good reach, you'll need to get up close and personal with your foes first! These Pikmin are made of solid rock, so they can stand up to a lot of attacks and won't get hurt when they get stepped on. They specialize in body blows, dealing a lot of damage when thrown, and they can also break right through glass and crystal. They can't latch on to other creatures, though. But that's OK—nobody's perfect! These pink Pikmin have big, blue eyes and nice wings to help them fly. In Smash Bros., they show up to carry Olimar and friends through the air. However, how high and far they can fly is affected by how many friends they have to carry. More Pikmin will weigh them down. This particular type of Pikmin has a pink body, blue eyes and...wings? Yep, they can fly, and in this game, they can even give Olimar a lift. The only thing is they'll get tired very easily, especially if they're carrying lots of other Pikmin at the same time. Go easy on them, OK? Olimar still uses all the Pikmin from Smash 4, with few major changes. Rock Pikmin are the only type of Pikmin that haven't been utilized in Olimar's moveset. This page was last edited on February 3, 2019, at 01:02.